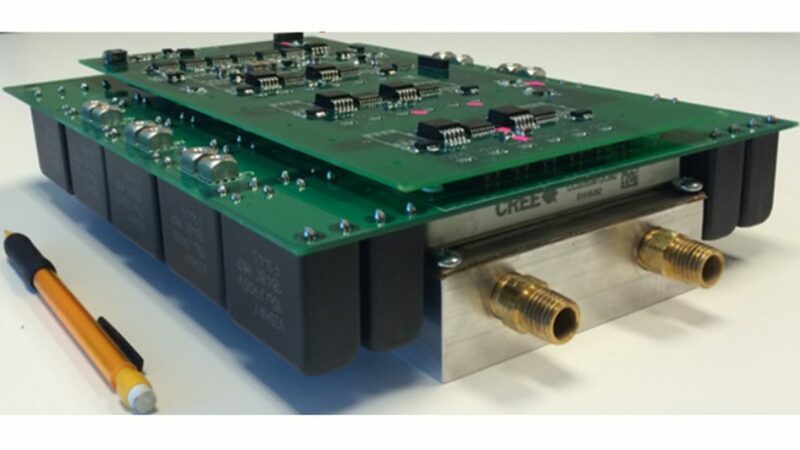 Researchers at North Carolina State University have developed a new type of inverter device with greater efficiency in a smaller, lighter package – which should improve the fuel-efficiency and range of hybrid and electric vehicles. Electric and hybrid vehicles rely on inverters to ensure that enough electricity is conveyed from the battery to the motor during vehicle operation. Conventional inverters rely on components made of the semiconductor material silicon. Now researchers at the Future Renewable Electric Energy Distribution and Management (FREEDM) Systems Center at NC State have developed an inverter using off-the-shelf components made of the wide-bandgap semiconductor material silicon carbide (SiC) – with promising results. “Our silicon carbide prototype inverter can transfer 99 percent of energy to the motor, which is about two percent higher than the best silicon-based inverters under normal conditions,” says Iqbal Husain, ABB Distinguished Professor of Electrical and Computer Engineering at NC State and director of the FREEDM Center. Range is an important issue because so-called “range anxiety” is a major factor limiting public acceptance of electric vehicles. People are afraid they won’t be able to travel very far or that they’ll get stuck on the side of the road. The new SiC-based inverter is able to convey 12.1 kilowatts of power per liter (kW/L) – close to the U.S. Department of Energy’s goal of developing inverters that can achieve 13.4 kW/L by 2020. By way of comparison, a 2010 electric vehicle could achieve only 4.1 kW/L. “Conventional, silicon-based inverters have likely improved since 2010, but they’re still nowhere near 12.1 kW/L,” Husain says. The power density of new SiC materials allows engineers to make the inverters – and their components, such as capacitors and inductors – smaller and lighter. “But, frankly, we are pretty sure that we can improve further on the energy density that we’ve shown with this prototype,” Husain says. That’s because the new inverter prototype was made using off-the-shelf SiC components – and FREEDM researchers have recently made new, ultra-high density SiC power components that they expect will allow them to get closer to DOE’s 13.4 kW/L target once it’s incorporated into next generation inverters. What’s more, the design of the new power component is more effective at dissipating heat than previous versions. This could allow the creation of air-cooled inverters, eliminating the need for bulky (and heavy) liquid cooling systems. The current SiC inverter prototype was designed to go up to 55 kW – the sort of power you’d see in a hybrid vehicle. The researchers are now in the process of scaling it up to 100 kW – akin to what you’d see in a fully electric vehicle – using off-the-shelf components. And they’re also in the process of developing inverters that make use of the new, ultra-high density SiC power component that they developed on-site. A paper on the new inverter, “Design Methodology for a Planarized High Power Density EV/HEV Traction Drive using SiC Power Modules,” will be presented at the IEEE Energy Conversion Congress and Exposition (ECCE), being held Sept. 18-22 in Milwaukee. Lead author of the paper is Dhrubo Rahman, a Ph.D. student at NC State. The paper was co-authored by Adam Morgan, Yang Xu and Rui Gao, who are Ph.D. students at NC State; Wensong Yu and Douglas Hopkins, research professors in NC State’s Department of Electrical and Computer Engineering; and Husain. A paper on the new, ultra-high density SiC power component, “Development of an Ultra-high Density Power Chip on Bus Module,” will also be presented at ECCE. Lead author of the paper is Yang Xu. The paper was co-authored by Yu, Husain and Hopkins, as well as by Harvey West, a research professor in NC State’s Edward P. Fitts Department of Industrial and Systems Engineering. The research was done with the support of the PowerAmerica Institute, a public-private research initiative housed at NC State and funded by DOE’s Office of Energy Efficiency and Renewable Energy under award number DE-EE0006521. FREEDM, a National Science Foundation Engineering Research Center, is aimed at facilitating the development and implementation of new renewable electric-energy technologies.